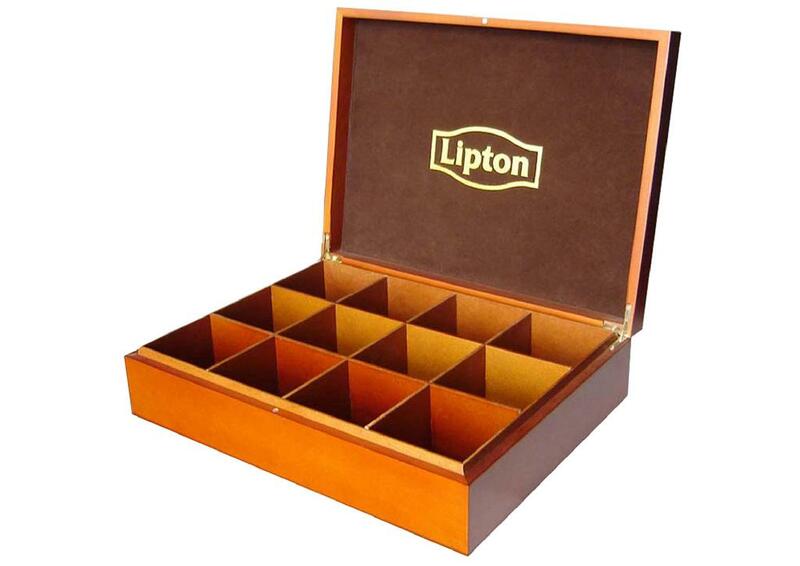 This beautiful 12 compartment Lipton wooden tea box was crafted from solid poplar wood and was made for our customer, the Lipton Tea Company. This Lipton tea box meets food regulations, stamped with a logo, and carefully stained. Felt is used in the lining of the lid and bottom of the box. We also use sturdy 90 degree hinges and magnets to keep the box secure. Extreme Enterprise is a first class manufacturer of high quality custom wood boxes. We are committed to providing you with an excellent product that will exceed your expectations, excellent customer service and a guaranteed price that will beat all our competitors. Utilizing our skilled craftsmen, we pride ourselves in manufacturing the highest quality custom made boxes available in China.